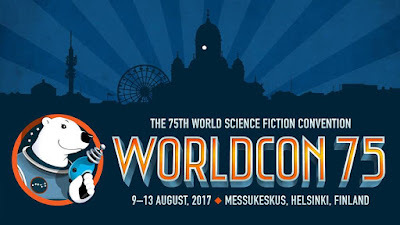 So... WorldCon 75 is about to begin and I'm not nervous at all! This will be my first WorldCon, and what better way to kick off than to begin right at home. As soon as I heard that this year the event was going to be hosted right here in Finland, I knew I was going to attend. Regardless of the level of truth there is to it, I can't get over the idea that no one ever comes to Finland! We're quite the small player on the world stage, so whenever something big and international happens in the worlds of anime or writing (particularly scifi/fantasy related), I get bonkers excited. Having attended Animecon in Kuopio just a few weeks ago, I knew that this would be a fantastic chance to meet and speak with other people from the same field. A brilliant way to meet new authors, writing enthusiasts, and maybe even agents all but a hop and skip from home. A networking possibility made from solid gold. So I set about actually pulling my socks up for once and setting all the social medias in order and such. I can't begin to describe what a project it's turned into! If there's any advice I can give to those planning to do the same, whether it's as an author or an artist, definitely don't leave setting yourself up online to the last minute! In my defense I will say that I was pretty good this time around: I actually gave myself a nice 2-2.5 weeks to work on this. "Ah, setting up a domain name, a blog, and ordering business cards can't be that hard." And it's not–it's navigating the minutiae that chips away insidiously at both your time and patience, until you realize that the event you need to attend is tomorrow and your web address still sends you to a 404 page instead of your blog. Then there's the huge litany of other things that aren't ready yet, since I am pedantic about preparations. Nope, not nervous. Or freaking out. Calm as sheet ice floating across the arctic. Also, not gonna lie, am very happy to have the perk of being able to pop home for lunch! If you are also heading for WorldCon, do enjoy yourselves, and should you be staying in a hotel, please do avail yourselves of the blackout curtains as it stays quite light outside until the wee hours. Fantasy novelist, IT geek and artist. Very Finnish. Currently obsessed with Undertale. Writing the Immortal Lightning YA fantasy trilogy. Into anime, dogs, and all things cute and funny. And What Will You Do When You're Older?